Green Heck is one of the leading manufacturers and suppliers of kitchen ventilation applications and their product range includes kitchen ventilation canopies, exhaust fans, makeup air devices, louvers and dampers. The company primarily caters to exhaust and ventilation requirements of industrial and commercial establishments. Wall mounted kitchen ventilation fans are essential components of canopy or hood ventilation systems that are specially designed for the collection of heat, grease and other cooking effluents from cooking appliances that are positioned against the kitchen wall. This wall mounted ventilation solution comes in different canopy options and sizes. As the name implies, this kitchen ventilation application by Green Heck are intended for independent and single kitchen islands. 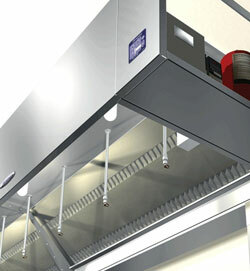 This ventilation system features a unique hood design known as V-bank, which facilitates the collection and containment of cooking effluents. This Green Heck kitchen ventilation fan is normally used for a set of cooking appliances that are lined up in a single row and with no walls on any side. Because of its location, single island Green Heck kitchen ventilation fan units have stainless steel finish in all 4 sides as the ventilation device is visible from any direction. This kitchen ventilation solution by Green Heck is positioned at close proximity to the cooking appliance and this type of installation is more efficient and the configuration of the ventilation system allows for a smaller canopy and lower ventilation rates for the exhaust system. This is the ideal ventilation solution for kitchens with low ceilings and cooking applications that are of medium level. Proximity ventilation fans, which are sometimes referred to as backshelf ventilation fans, are the ideal choice for the ventilation of grease and heat which are generated in the kitchen. This type of Green Heck kitchen ventilation fan may come with a pass-over attachment or plate shelf as an optional feature. This is the type of kitchen ventilation solution by Green Heck which are primarily used for the venting of the vapors and heat generated in the kitchen. These are the ventilation fans that are applied for non-grease generating cooking appliances such as dishwasher and ovens. Green Heck offers an efficient and reliable solution for the elimination of grease in kitchen, which is a common problem in restaurants and other commercial establishments. The Green Heck kitchen ventilation fan becomes an integral part of a grease extraction and filtration system. This is the best solution to the nagging problem of rooftop grease buildup, frequent cleaning of ductwork and stringent air emission requirements.